Anticipate what might happen and be ready for it. 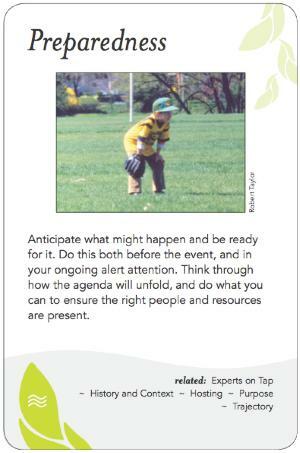 Do this both before the event, and in your ongoing alert attention. Think through how the agenda will unfold, and do what you can to ensure the right people and resources are present. Elements of anticipation include advance preparation, planting seeds, and perceptive attentiveness. All entail thinking ahead to what might happen and being ready if and when they do. Advance preparation includes all the activities that the facilitator and participants need to do to be ready to work effectively on the task at hand. Planting seeds entails imagining what might be possible with the right pre-planning and encouragement, so that they 'germinate' when and if the conditions are right. This might include e.g. two or three pre-prepared ideas to "get the ball rolling" in a challenging brainstorming session. Perceptive attentiveness is "just in time" anticipation -- sensing when something is about to go wrong or on a tangent or when there is a mood shift in the room, and taking actions before it occurs to pre-empt it. Dave once led a session where he anticipated conflict between three of the key attendees. He set up one of the other participants with a pre-agreed signal and, when the conflict arose, that participant jumped in with a prepared speech that acknowledged the long-standing differences among the three attendees and proposed a means of achieving a consensus that all could agree to. It appeared to be spontaneous and to come from "the crowd" rather than the facilitator and hence was effective in moving past the conflict.